Here's the 5-minute skirt how to I have been meaning to post. Please see the disclaimer at the bottom. And are you annoyed trying to read all this while at your sewing machine? I am! So get the PDF version right here. It's kind of a big file, just so you know. 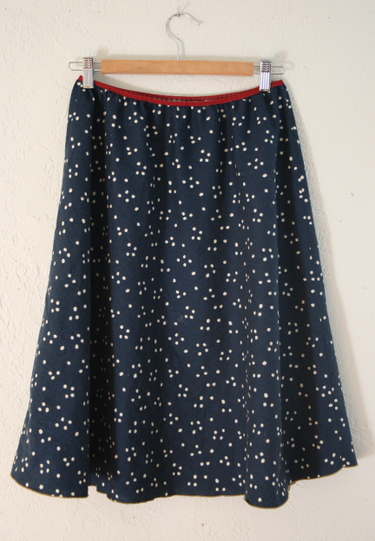 This super easy to sew skirt is 2 pieces, front and back, cut on the bias. 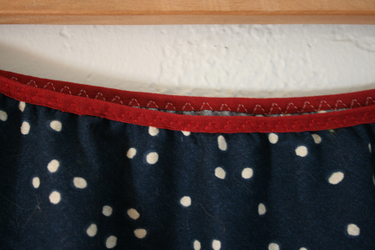 The waistband is FOE (fold over elastic) and the hem is rolled with a serger. You don't need a serger for this project—it just means you will need to hem your skirt the traditional way, which is any way you normally would. -skirt fabric (I strongly suggest a woven cotton with a wee bit of stretch. EDIT-—t's better if this fabric has no stretch than a fabric with too much. So a normal woven cotton would work, but not a cotton knit or jersey. )The best way to make sure you have enough fabric is to make your paper pattern first and take it to the fabric shop. Or, make your paper pattern and measure it out first, if you are ordering fabric online. Don't forget to get extra fabric for shrinkage. For a rough guide, figure about 2 1/2 yards for an XL and 2 yards for a XS, depending on the fabric width and your skirt length. This is a generous estimate. C=Your favorite skirt length. (Try measuring your favorite skirt as a guide for the length. If you are serging a rolled hem, no extra is needed. If you are using a traditional hem, add what you need, about 1" should do it if you are making a smallish hem. On my skirt, C =24") When drawing the pattern, Notice how the hem dips a bit, in the front? It's about a 1/2" dip, but it's really not a big deal, include it or leave it out. 2. 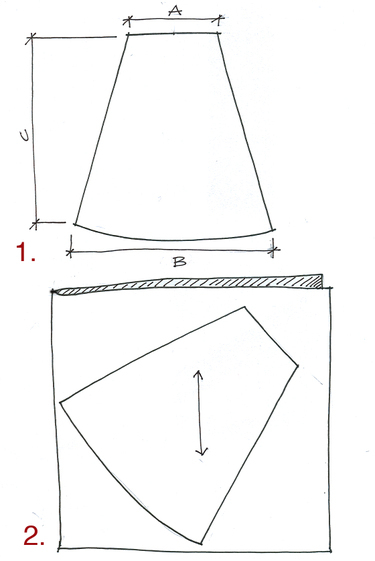 Lay this pattern out on the bias onto your folded skirt fabric. This means the grain of the fabric should match the arrow on the skirt in that sketch up there, see that? So the skirt pattern will lie at an angle. You will need to cut 2 pieces, which is why the fabric needs to be folded in half. 3/8" seam allowance already included. 3. Sew the skirt side seams right sides together. Turn it right side out and try it on. You should be able to fit it over your booty with a good tug. If it's too tight, cut 1/2" off the top to make the waist wider. Don't make it too big, it should be snug. It will stretch a bit over time. 4. Now sew the FOE onto the waistband using a zigzag stitch, stretching the FOE as you stitch. Try not to stretch the skirt fabric at all. Don't pre-cut the FOE, just stretch and sew it on. It won't fray, so when you are done stitching it on just sew right over the end, overlapping where you started. 5. Using a serger (and wooly nylon thread if you are extra fancy) serge with 3 thread rolled hem. The wooly nylon on one cone makes the rolled edge nice and full, covering the fabric edge completely. If you are sergerless, fold the edge over twice and edge stitch, or use the hem stitch on your sewing machine (Yes, there is one!) 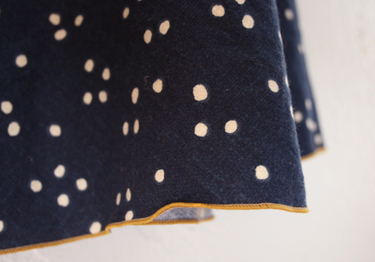 Go slow and ease as you need to, hemming on the bias can be a bit swear-y. You could also hem with bias tape, that would look super cute. You can use this method here. *Disclaimer: The 5 minutes only apply if you have a serger, all the supplies at the ready, and are sober. Please allow for extra time if your personal situation deviates from this.